We’ve been working to familiarizing the city of Seattle with the concept of bicycle skills parks. Bicycle Skills Parks come in all shapes and sizes. Where there is just a little space and maybe a desire to draw some activity to an underutilized spot, a skills park can be a small collection of obstacles that provide hours of practice and distraction for bicyclists who enjoy honing their skills. Much like skiing, skill cycling can provide a lifetime of incremental improvements. For young people, skills parks can be very important places to build confidence and self-esteem. It’s common for student’s grades to improve after they’ve found a passion like BMX bike riding or skateboarding. For active people of any age, these are places of focus and escape from the tensions of daily life. We’re ready to work with community groups to build skills parks of any size. Small – a few boulders or logs can make a neighborhood corner a gathering place where riders can build their trials skills and chat about life with while encouraging each other. Medium – given a half to two acres, a set of BMX jumps or a serpentine trail with obstacles can pack a lot of fun in a relatively small space. Large – when there is more room, a full mountain bike park can provide miles of trails for more riders and a greater variety of terrain. We’ve been working to show that Bicycle Skills Parks are the perfect match for Public Utility corridors. The Chief Sealth and the Interurban trails at the north and south ends of Seattle cut through many neighborhoods creating the perfect street end access to this public land. We have also been working to show the Seattle Department of Parks and Recreation that skills park serve many purposes and people for very low investments. Unlike most sports, the off-road cyclists prefer to take care of the trails and obstacles themselves to keep them in tip top shape. Trials is a style of slow riding where the object is to ride over things that would seem impossible to most people. It involves well timed lunging and hopping to move almost as far vertically as horizontally. Balance is the name of the game here. This style is all about getting up in the air to perform unlikely tricks – the more outrageous the better. This is similar to Olympic high diving. In a few seconds, jumpers squeeze in a variety of twist, turns and flips, then land as smoothly as possible. Usually jumps are lined up in rhythm sections – groups of 6 to 10 jumps that are spaced for continuous runs. The ballet of BMXing. It is done on flat ground on a bike that has foot pegs on the axle ends among other special modifications. The rider climbs all over the moving bicycle as it rolls forward or backward, or spins around while balancing on just one tire. The must be seen to be conceived of. Bikes use the same bowls railings and ramps as skateboarders. Extreme sports competitions showcase professional level riders and skaters on the same fabricated terrain. Like dirt jumping and flatland, the goal is to perform very difficult and precise tricks. In some community parks, where riders and skaters have decided to get along, this is a wonderful mixture of Olympic class skills. In other parks where people act like racists, it doesn’t work out. Surfers can experience the same sort of trouble on some “local” beaches. A BMX race is an all-out 90 second sprint around a tight course of banked turns and jumps. The bike handling skills learned on the track are similar to slalom ski racing – very fast and precise. 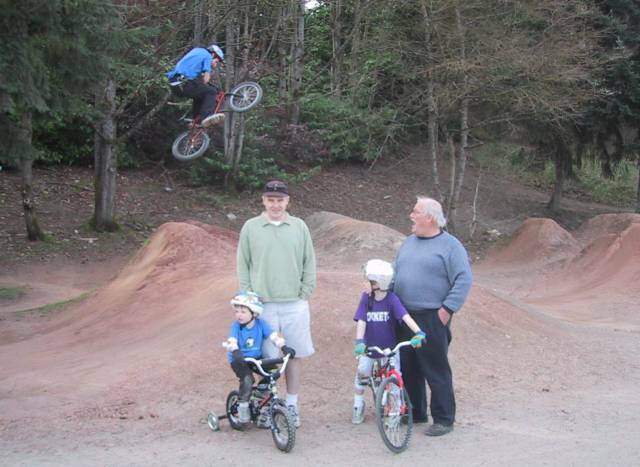 Ex-BMXers make awesome mountain bikers.